DVS Shoecompany have been around the wake industry for a few years now and are recently getting more attention due to their new wakeskate shoe that will be hitting the market soon. In light of the new wakeskate shoe, we also wanted to find out more information about DVS and how they have become a player in so many action sports industries (including the wake industry). To get this information, we turned to our main contact at DVS, Sam Ratto. Sam Ratto is the man behind DVSWake.com and is employed in the Marketing Department at Podium Distribution. Podium Distribution is the parent company of DVS Shoecompany. So with a slight introduction out of the way, we'll let Sam handle the rest and begin the interview questions. Wakeskating.com (WS): To start things off, tell us a little bit about your background with DVS and how you got started with them. Sam Ratto (SR): I started at DVS working in the warehouse sweeping up and shipping out sales samples, but mostly I played basketball with Tim Gavin for the first 3 months. From there I dabbled in international sales but it just wasn’t a fit. Then 2 years ago they offered me a job driving a motor home around the country, so of course I jumped at the chance. I have been working here for almost 3 years and hopefully will continue to work at this amazing company. This year I have taken on a lot more responsibility and I took some of the burden off of Thomas Horrell by becoming the Wake sports team manager. My official title though is Model Scout. WS: DVS has their foot in many of the action sports industires, how long did DVS focus solely on skating? What was the next sport you guys branched out on? SR: DVS will always focus on skateboarding, forever! The best part about DVS is that we have a lot of good people in here that like to do a lot of other sports. It isn’t like we watch the X Games and pick the top guy to sponsor. Most of our athletes are our friends first and foremost that is why we branched out. Thomas Horrell has basically been on the team for 5 years, even though the public thinks we just got involved. All of the sports we are involved in, we actually do. Although, there will never be a professional DVS foosball team. WS: With the launch of the DVS wake website, it looks like you guys are serious about being in the wake industry. What was it that was appealing about the wake industry to make DVS want to be a part of it? SR: Cassette. The whole crew down at Cassette are some of the funniest people I have I ever met. We got involved in the wake industry because we believe in what they are doing and why they are doing it. I personally will be doing rider support all throughout the year at tour stops, so I look forward to getting more involved. With the Bud Light tent mainly! WS: What can we expect from the new DVS wake site? Will it be mainly news about the riders and such or about the entire industry? SR: Mainly it will about DVS riders and DVS tours. There are a lot of websites already that have the gossip taken care of. DVSWake.com is based upon humor and having a good time while giving kids some information about our team. But really, it is just a place where you would go to have a laugh as well as find out about the team. WS: So how exactly did you guys hook up with Cassette? WS: Is DVS looking for other riders outside of the Cassette team for their wake division? SR: We are always looking for kids pushing the sport of wakeskating and wakeboarding, but of course they have to measure up to the standards that the Cassette team has set. If you don’t have your A game, don’t come to the plate. WS: Can you tell us a little bit about the Dresden's (the DVS wakeskate shoe)? SR: We have been making open cell mesh shoes for Thomas, Jim, Aaron, Danny and our own C team (Myles, Josh and Party boy) for 4 years. The idea had been swirled around the office to sell the shoes but up until we spoke with Chuck at Ambush it was just a dream. Chuck at Ambush/Buywake.com actually is the reason the Dresden wake model is going to be on the market. We teamed up to do an exclusive model with Ambush/Buywake.com so it should ship early spring just in time for summer shredding! WS: Are there any special features built into the shoe especially for wakeskating? SR: The special features are secretly special so they can’t be released. I can disclose that these shoes will make for a more pleasurable wake skating experience for the whole crew. WS: There are quite a few wake skate shoes to choose from these days. How will DVS differentiate their wake skate shoes from the competition? SR: Style. Our shoe is the only shoe that you would wear to a party then wake up in the afternoon and go wakeskating. The special tongue that is in the shoe keeps the shoe more secure to your foot and the foam we use is much lighter. All around our shoe is made for the kids that need a pair of school shoes and a pair of wakeskate shoes. Constructed for Deconstruction! WS: Will there be a Cassette Team Edition Dresden shoe? SR: Maybe in the future we will work on something but Thomas is too busy with his new wireless modem lap top to be bothered with a team shoe! WS: What other plans can you tell us about, that DVS has for their wake department? Will you concentrate on wake skating only or both wake skating and wakeboarding? SR: We will continue to support the people that have been with us since the beginning and support the 2 sports for years to come. WS: DVS currently has a foot in the skate, snow, surf, moto and wake industries. Has it been hard to get accepted as a legit company in so many different sports? SR: Not really because as I stated before we have always sponsored guys in each respective sport. For example, Brian Dunlap (Owner, Vice President Podium Distribution) has been snowboarding since he was 10 and started riding a dirt bike when he was 13 or so. A lot of the pro snowboarders new him from seeing him ride at Mammoth every winter and having a couple (term used lightly) cocktails with him at the bar. It was only a matter of time until we started to put a solid team together based upon our friends. WS: How does the DVS skate team feel about wake skating? Do any of them wake skate? SR: After Sfumato came out I showed the video to a couple of our skate bros and all of them where shocked at the stuff they did in the video. Of course they are skeptical about anything involving a lake because they don’t like water, but they said they liked watching it! WS: DVS recently hooked Wakeskating.com up with a Lazynator 2 bag. This bag is perfect for long days at tournaments or wake events. What was the concept behind the unique design? SR: Drinking beer at the lake and keeping it cool while you sat on it. WS: Will DVS be sponsoring any wake skating events in the upcoming season? SR: It all depends on the type of events and the people behind them, if Dishman is running something I would like to work with him. He knows a lot of good late night spots! WS: Is there anything you want us to know about DVS that we didn't cover in our questions? SR: If it wasn’t un-covered in this interview than we should keep it covered. Stay in the curl bro! This large bag will carry everything you need for a day on the lake and with its fold out seat you are guaranteed to always have a place to sit. Made of water resistant polyurethane coated ripstop. Large top zippered main compartment. Multiple zippered rear organizer pockets. 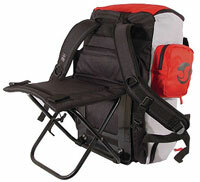 Bottom compartment holds a 12 pack with a side drop zippered opening. Zippered side pocket and expandable mesh side pocket. Fold out padded chair. Contoured shoulder straps. Vertical skateboard/ snowboard carrying straps. The Milan definitely pushes the limit in style and is a showcase for the DVS designers. Leather upper. Reinforced toe cap. Comfortable elastic tongue straps. Lightweight EVA midsole. Non-slip herringbone tread pattern. The Huf 3 Lo skate shoe features a triple stiched ollie gaurd, supportive air pockets in the sold and air holes in the toe area for better ventilation.